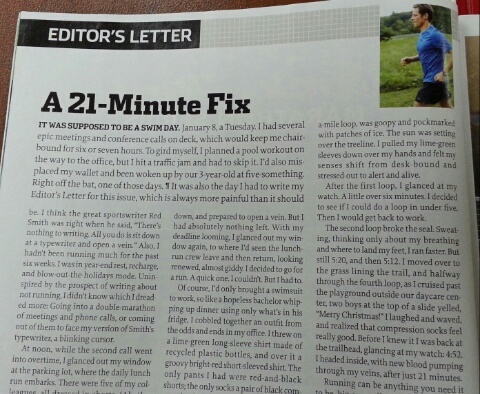 The March 2013 edition of Runners World magazine written by editor-in-chief David Willey was inspiring. He had intended to go for a swim that day but ran out of ideas. Eventually he went for a good 21 minute run- he was having a stressed up day and was out of idea to write the Editor’s Letter for the issue. After going for a run, he felt so good and his mind was then filled with ideas. When we feel stressed up and tempted to skip that day’s workout. Often a good sweat would make us feel much better than indulging in food. Due to time constraints, I’ve picked on one or two weekdays to workout. When I feel mentally tired and had a long day at work….I surprised that I seemed to get that burst of energy -as if I am burning off the negative energies from work. The next day, I wake up refreshed and ready to tackle on the challenge of the day. You may feel that you do not want to exercise cause you may be too stressed up. But you may surprise yourself…. after that good run or a kickboxing class later, you would feel the cobwebs melt away. In a clear and creative mind, you would be ready to take on anything.